The densest galaxy in the nearby Universe may have been found. This galaxy weighs more than 200 million suns, over half of which is concentrated within a radius of just 80 light years. The density of stars in that region is 15,000 times greater than found in Earth's neighborhood in the Milky Way. Chandra, Hubble, and ground-based telescopes were used to discover and study this galaxy. The densest galaxy in the nearby Universe may have been found, as described in our latest press release. The galaxy, known as M60-UCD1, is located near a massive elliptical galaxy NGC 4649, also called M60, about 54 million light years from Earth. 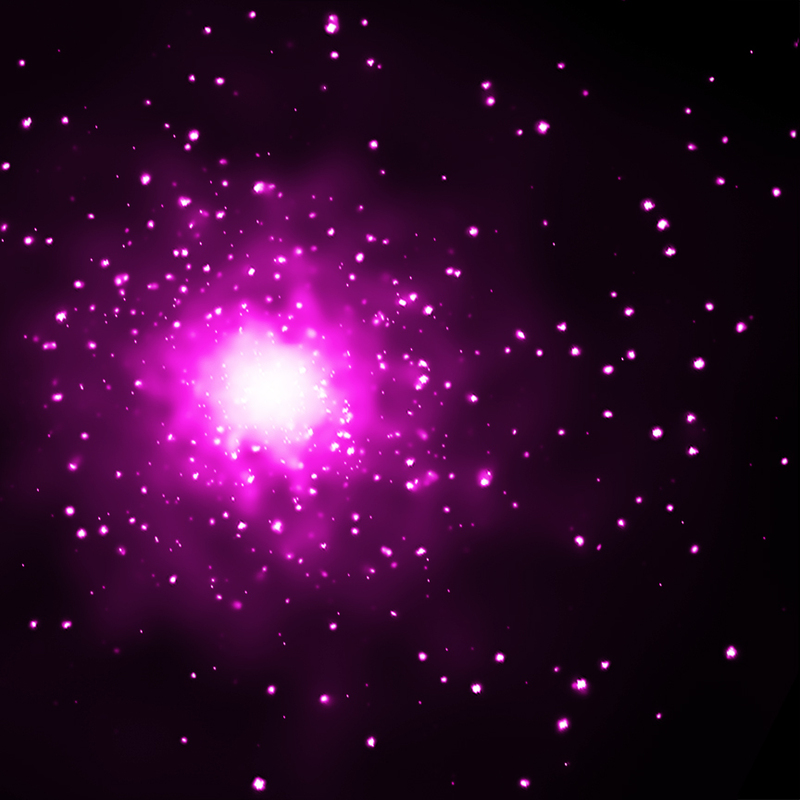 This composite image shows M60 and the region around it, where data from NASA's Chandra X-ray Observatory are pink and data from NASA's Hubble Space Telescope (HST) are red, green and blue. The Chandra image shows hot gas and double stars containing black holes and neutron stars and the HST image reveals stars in M60 and neighboring galaxies including M60-UCD1. The inset is a close-up view of M60-UCD1 in an HST image. Packed with an extraordinary number of stars, M60-UCD1 is an "ultra-compact dwarf galaxy". It was discovered with NASA's Hubble Space Telescope and follow-up observations were done with NASA's Chandra X-ray Observatory and ground-based optical telescopes. It is the most luminous known galaxy of its type and one of the most massive, weighing 200 million times more than our Sun, based on observations with the Keck 10-meter telescope in Hawaii. Remarkably, about half of this mass is found within a radius of only about 80 light years. This would make the density of stars about 15,000 times greater than found in Earth's neighborhood in the Milky Way, meaning that the stars are about 25 times closer. The 6.5-meter Multiple Mirror Telescope in Arizona was used to study the amount of elements heavier than hydrogen and helium in stars in M60-UCD1. The values were found to be similar to our Sun. 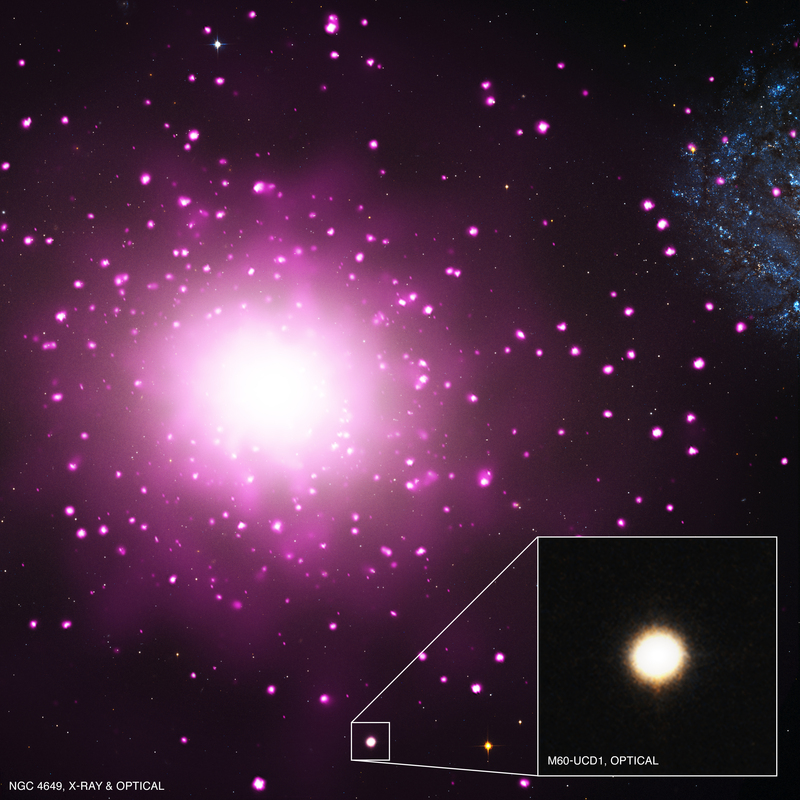 Another intriguing aspect of M60-UCD1 is that the Chandra data reveal the presence of a bright X-ray source in its center. One explanation for this source is a giant black hole weighing in at some 10 million times the mass of the Sun. Astronomers are trying to determine if M60-UCD1 and other ultra-compact dwarf galaxies are either born as jam-packed star clusters or if they are galaxies that get smaller because they have stars ripped away from them. Large black holes are not found in star clusters, so if the X-ray source is in fact due to a massive black hole, it was likely produced by collisions between the galaxy and one or more nearby galaxies. The mass of the galaxy and the Sun-like abundances of elements also favor the idea that the galaxy is the remnant of a much larger galaxy. If this stripping did occur, then the galaxy was originally 50 to 200 times more massive than it is now, which would make the mass of its black hole relative to the original mass of the galaxy more like the Milky Way and many other galaxies. It is possible that this stripping took place long ago and that M60-UCD1 has been stalled at its current size for several billion years. The researchers estimate that M60-UCD1 is more than about 10 billion years old. These results appear online and have been published in the September 20th issue of The Astrophysical Journal Letters. The first author is Jay Strader, of Michigan State University in East Lansing, MI. The co-authors are Anil Seth from University of Utah, Salt Lake City, UT; Duncan Forbes from Swinburne University, Hawthorn, Australia; Giuseppina Fabbiano from Harvard-Smithsonian Center for Astrophysics (CfA), Cambridge, MA; Aaron Romanowsky from San Jos'e State University, San Jose, CA; Jean Brodie from University of California Observatories/Lick Observatory, Santa Cruz, CA; Charlie Conroy from University of California, Santa Cruz, CA; Nelson Caldwell from CfA; Vincenzo Pota and Christopher Usher from Swinburne University, Hawthorn, Australia, and Jacob Arnold from University of California Observatories/Lick Observatory, Santa Cruz, CA. Coordinates (J2000) RA 12h 43m 40.30s | Dec +11° 32' 58.00"
distance between stars in M60 UCD1? How does the mass of this compare with the average mass of globular clusters? Are we talking order of mag. larger? Was this thought to be a globular orbiting M80, and found to be much heavier? The stars in M60 UCD1 are 25 times closer than those in the vicinity of our sun, not 25%. Gravity goes as the square of the distance, so average gravity overall would be 625 times greater than that in our vicinity. Still, it's not nearly enough to disrupt spacecraft, since there is still a huge distance between stars in that galaxy. Thank you very much for the text, photos and explanations ! If there are that many stars stacked on top of a giant black hole wouldn't the black hole become active again? That is amazing, but if the galaxy M60 UCD1 is only 80 light years and the stars are almost 25% closer than our star, wouldn't the gravitational pull be 25% greater. Could any of our crafts handle the pressure? Oh, how I wish I would have had the wisdom to study astronomy and other related fields as I grew up. Being older now, I can only appreciate the tremendous advancement your field has made over the decades. I thrill at the sight of so many spectacular photos and distant galaxies that you investigate. Please, please continue your amazing discoveries so we all may enjoy your work! An ultra-compact dwarf galaxy, weighing 200 million times more than our Sun. About 54 million light years from Earth. Combining X-rays from Chandra with optical data from Hubble Space Telescope. In the constellation Virgo, visible in the Northern and Southern Hemispheres.